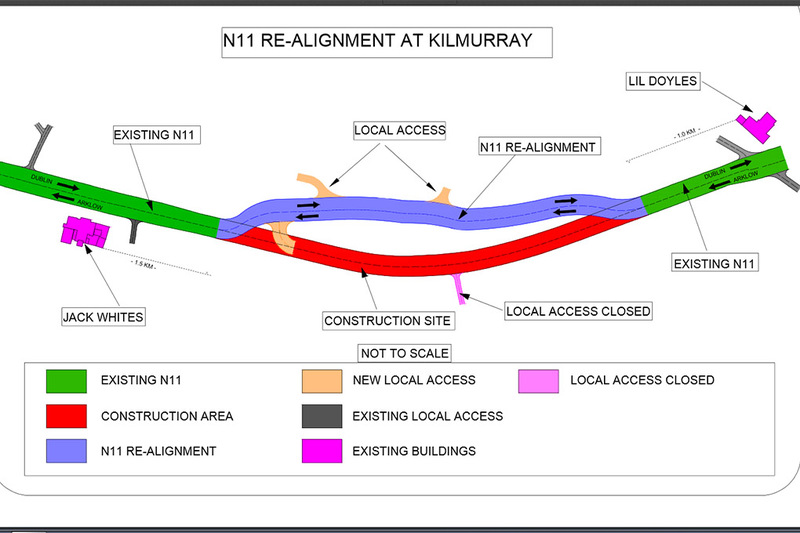 To facilitate construction of the new N11 dual carriageway between Arklow and Rathnew, traffic will be diverted off the existing N11 carriageway at Kilmurray, effective from Tuesday morning, 12th August 2014 . The area of the N11 affected is located approximately half way between the Jack White’s and Lil Doyle’s crossroads (red on sketch). Traffic travelling northbound will leave the N11 approx 1.5km north of Jack Whites and travel on a new temporary alignment (purple on sketch) parallel to the existing N11 for approximately 1.3km and rejoin the existing N11 approximately 1km south of Lil Doyles. Southbound traffic will leave the N11 approximately 1km south of Lil Doyle’s and follow this route in reverse. This diversion will be in place until the new dual carriageway is opened to traffic in August 2015. Motorists are advised to allow additional time for their journeys. They are also urged to take great caution on the approach to this diversion and to obey the 60km/hr speed limit which is in place.